RAW has 6 posts on musculoskeletal ultrasound over the past 4 years. There have been a flurry of publications on the topic since the last one, Ultrasound for Seeing Invisible Inflammation in Rheumatoid Patients, in December. There’s a lot to talk about, so today will be the first of a series. If you haven’t, this is also a good time to catch up on the topic by reading the earlier musculoskeletal ultrasound posts. Why would musculoskeletal ultrasound matter to Rheumatoid Disease patients? In Rheumatoid Arthritis Swelling, Take Two (2011), I told you about a study by Dr. A.K. Brown that showed 96% of people judged by rheumatologists to be in “clinical remission” actually showed disease activity when examined with expert ultrasound or MRI. That study corroborated the comments of thousands of persons with Rheumatoid Disease (PRD) on this site: that they experience signs of disease activity even if external swelling is inconspicuous, such as the 460 of them here and here. Donia: My mother (deceased now) and I both have severe rheumatoid arthritis. Mother’s hands were horribly painful. They were so misshapen they appeared to look like paws. Mother had gigantic lumps on her fingers and wrists. I have never had much visual swelling. By the time I would ice a painful joint and go to the doctor, they couldn’t detect any swelling and I would get dismissed with a shrug. Only on Xray, could you see my RH damage. It took me 15 years to get an accurate diagnosis because I didn’t have the classic swelling and lumps. I was so deformed and had had so many joint surgeries that I could hardly walk any longer. Still, no swelling to confirm the diagnosis until 2011! Melissa: Wow!! I am dealing with this exact problem! I have recently had to switch Rheumy because of lack of insurance and in seeing her for the first time last week, she also suggested that there was no swelling, just be looking at the tops of my hands! I have all other symptoms and I have been on RA drugs for many years…Why are these doctors not taking us seriously?? Meanwhile, I am only on pain meds because this new doctor believes that since there is “no swelling” than I do not need any RA drugs!! What do I do?? Jenn: I am so grateful for this and your previous post about swelling as well as all the responses. I am a thin woman and I see swelling where others can’t. There are times I have to wear larger shoes or cannot wear my rings. I had an ah-ha moment as I was reading the responses. The increase of pressure marks in my skin (lines from my pillow case, marks from a pair of socks, bra strap dents, etc) ARE SIGNS OF SWELLING. There have been 3 days in the last 3 months where my husband has been able to visually see swelling (and I took photos), though he notices the pressure marks all the time. Having times when my fingers, wrists, feet, whatever are larger (read: without sausage look) is indicative of swelling due to my RA. 1. Last year in D.C. at the ACR’s annual meeting, instruction was offered in ultrasound. 2. The presentation on ultrasound by Dr. Kelly was only one of those at EULAR this year. 3. Earlier in 2013, EULAR passed a list of 10 recommendations for imaging in Rheumatoid patients. 4. The importance of MSUS is being investigated in young Rheumatoid patients (JRA / JA). Why isn’t ultrasound available for Rheumatoid Disease patients? “Ultrasound” is used in several medical specialties. I’ve had one one of my thyroid, and one of Roo before he was born; and my bff had an ultrasound of her breasts a few years back. But ultrasound of the musculoskeletal system is hard to come by in the U.S.
1. Machines are an expense that practices do not have resources for right now. 2. Doctors have more than enough to do in the short appointments they have with PRD. Most of them are unaware of the impact MSUS could have on their patients. 3. But the biggest reason is lack of training in MSUS, so we’ll look at that next time. It’s tough to find a rheumatologist office that owns an ultrasound machine; and if you do, it’s likely she/he has only been taught to use it for guiding injections. I can’t say it often enough: there is still so much to learn about RD. The duty of all in medicine is first to do no harm, and this is difficult with a disease that’s been such a mystery. But the situation should not continue the way it is – many patients are harmed by late diagnosis or refusal to treat because a doctor does not recognize that disease activity exists when they don’t detect what is (in their opinion) conspicuous swelling. Does It Matter Whether Rheumatoid Arthritis Affects DIP Joints? 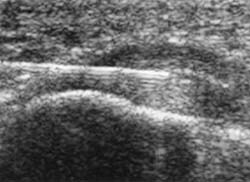 The picture: the blurry image is a foot ultrasound (public domain). 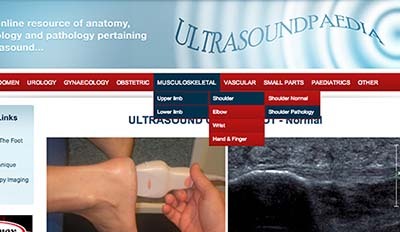 You can view much clearer ones at Ultrasoundpaedia where ultrasound methods are outlined. I’d love to show this site to the docs who’ve told me there’s no such animal as MSUS. I understand that at EULAR 2013 in Madrid there was talk of updating basic care guidelines to include ultrasound as a standard of care for RAD patients. I think this is a very good idea and would force more Rheumies to use it. I, as Diane, am blessed to have a Rheumatologist that has ultrasound in his office. That is one of the tools he used in diagnosing me as a sero-negative RD patient several years ago. In fact, recently, his office had a trainer in to train the staff on the use of a NEW type of ultra-sound machine and I was invited to be one of the patients used in the training. It was very interesting listening to the trainer explain to the PA’s what she was seeing and what it meant. I had no idea ultrasound was not already part of the mainstream in diagnosing RD. It certainly should be. Last summer I was diagnosed with RA. My rheumatologist ordered ultrasounds of both hands. The inflammation was severe in both hands. She looked at my hands and knew it was RA as I was in denial. We took the proper course of action. Also had shoulder and neck x-rays. Both were available in the hospital and insurance paid. I am so fortunate! Thanks Kelly for continuing to draw attention to how important ultrasound and MRIs are in rheumatology. In my case, I had a rheumatologist when I was first diagnosed who ordered ultrasounds at the University Hospital lab that showed active inflammation and erosions and NO OTHER TESTS showed this. When there was a debate with my new rheumatologist about how active my disease was – or if I even had the disease – once again, ultrasound showed conclusively that my RA was active and worsening compared to the first ultrasound results. As we know, blood markers for inflammation (CRP and ESR) are normal in a high percentage of people with RA and joint exams by rheumatologists are not as reliable as ultrasound or MRI in detecting inflammation. My inflammation markers and joint exams were not very helpful in my case. “I don’t think your foot is broken because I just pushed around on your foot and although it hurts, I think you’re exaggerating or you’re probably depressed. No, it doesn’t FEEL broken. No, I won’t do an MRI or ultrasound – even though this would show objectively whether or not there is damage in your foot”. HOW RIDICULOUS. We have to stop accepting this kind of negligent treatment and ask for what we need. The tools are now available to objectively track joint inflammation (synovitis), joint erosions, and hypermia by using MRI and ultrasound. X-rays do NOT show inflammation at all and show erosions only several years after they occur. X-rays are obsolete tools in rheumatology – end of story. In my humble opinion, there might NOT be a lack of training in the USA to perform advanced imaging but rather the field of rheumatology is slow to change. Radiologists and radiology technicians are far better equipped to be the professionals to perform these imaging tests. If there is a lack of training, the Targeted Ultrasound Initiative in the UK offers this training as does the American College of Rheumatology. Why do busy rheumatologists feel they need to be trained to perform ultrasounds and MRIs? Why not just work with a lab that already has the expertise or work with the lab to get the people trained? Europe is far ahead of North America in the use of advanced imaging techniques. I was thrilled to see the EULAR guidelines published in 2013 on imaging in rheumatology while North American rheumatologists debate whether or not the practice is valid and reliable. It is a silly discussion that is costing people with RA their lives- as your post so eloquently points out. We need to become informed and we need to also demonstrate a certain level of outrage as lives are lost to this disease. We also need to work along side the medical professionals in helping remove barriers to the use of ultrasound and MRIs in rheumatology. For example, in some jurisdictions, there is not a billing system in place to pay for ultrasound or MRIs for RA. Kelly, thank you once again for your remarkable leadership in advocating for people with RA. I believe your intelligence, personality, and tireless efforts on our behalf have single-handedly changed the practice of rheumatology. I hope and pray you are able to continue these efforts. Thank you again for highlighting the “you have no swelling therefore not RA” philosophy! It delays treatment for so many of us! Sally, you’re so right – It may be the single greatest misconception causing the most harm to PRD. Kelly, thank you so much for bringing attention to these things! I have been dealing with pain at varying degrees every single day since mid-April & I believe my rheumatologist hasn’t diagnosed me with RA yet because I don’t have severe visible swelling, even though I have all other symptoms. I can feel the inflammation going on. My shoes don’t fit, my rings don’t fit, & this pain has been getting worse & the more I do, the more it hurts. If only all doctors would offer ultrasound as an option, & really listen to the patient. “If only all doctors would offer ultrasound as an option, & really listen to the patient” Yes! as long as they know how to use it properly, it would be a huge step. And listening to the patient (or using questionnaires) can be done today at no cost. My Dr would use the Ultrasound on my knee so she could pinpoint where to take fluid from, l had never seen them before made a big difference where she knew to put the needle in. It’s hard to understand why this isn’t standard practice. Ultrasound is much cheaper than MRI, it doesn’t expose patients or staff to radiation, and it seems to be very accurate. It can’t be too awfully difficult to train someone to conduct an ultrasound exam. I’m sure the equipment isn’t cheap, but neither is xray or MRI equipment. What’s to lose? Yes, you’re right – it’s the cheapest and most accurate way to judge SOME aspects of rheum dz. (MRI and or CT scan are better for some). The training itself is not that hard, but it can take a new user a couple of hundred uses to be a reliable user – operator error is a big concern so a new user needs to do it w/supervision until his results are reliable. we’ll cover training in the next post – soon I hope. Question – if we were talking about another disease, like cancer, would there be any question or hesitation (or excuse) for not using valuable equipment for diagnostics, like ultrasound. Great question, Donna! I don’t think there would be any hesitation. Most people in general have this idea that cancer is automatically worse than RA & needs immediate treatment, but act like RA is no big deal. What they don’t realize is that a lot of cancers are very treatable if caught early enough & once treated, the person can basically live a normal life after. With RA, we have to live with it the rest of our lives. My doctor always uses the ultrasound machine and in fact just diagnosed arthritis of the neck in my 84 year old father. He thought it was his shoulder! Good doctors make all the difference! Clinical use of US by non-radiology providers is on the rise. Sadly… Many payors are starting to deny reimbursement – so the future of this trend is in jeopardy. I personally find US to be very useful clinically. With color power Doppler we are able to see inflammatory changes around the tissues we study. While I am not a hand surgeon or rheum I find it to be an invaluable tool in working with patients with shoulder elbow and ankle pain. Thank you Dr. Luks. I would like to see a committee to work on an initiative about the need for advanced imaging such as MRI or ultrasound to be paid by insurers for people suspected of having RA or for those with RA to track disease activity. I don’t know how this might be accomplished but North America is years behind the UK regarding this practice. Can you recommend an avenue to pursue this? Many of us have advanced degrees and expertise in research or have served on professional committees who are diagnosed with rheumatoid arthritis / rheumatoid disease. I’m sure there are doctors and people with rheumatoid arthritis who would serve on such a committee. When the Rheumatology News published the article on the presentations about ultrasound at the EULAR Conference, I wrote a comment. I would encourage other people with RA who are reading this to please take a moment to comment, as well. It is often the voice of people with conditions who advocate that change the face of medical practice. Kelly Young is an amazing example of such an advocate. Thanks. I rarely have visible swelling, but like others I can’t wear my rings, had to cut off my toe ring due to swelling, and sometimes my shoes are too tight. But to the naked eye, nothing looks expecially swollen. When I look back to the other injuries I’ve had, I rarely swell or bruise appropriately. I shattered my leg in a skiing accident and the surgeon postponed surgery in anticipation of significant swelling, that never happened. I injured my back/pelvis in a serious skiing accident. Had to be evacuated by spine board and ambulance, couldn’t walk for a week because of severe pain, and my back felt tender to the touch for a full year after my crash. And I never had significant swelling or visible bruising. Maybe it’s just how my body reacts? Luckily my rheumatologist doesn’t make treatment decisions based on my swelling.